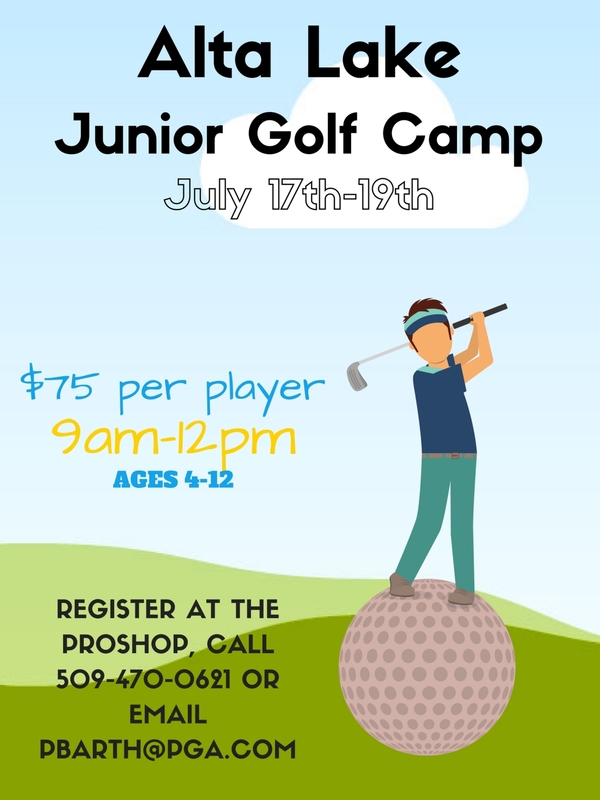 The Junior Golf Camp at Alta Lake Golf Course is designed to teach junior golfers about golf and physical fitness in a fun-filled, friendly atmosphere that makes learning golf easy and exciting. We use age-appropriate equipment and proven techniques that challenge your young athlete, yet gives them the chance to experience immediate success. Sign up for our upcoming golf camps now. It is about having fun and developing a love for the game of golf. We create this enthusiasm through proven programs that make learning golf easy and exciting. This camp uses age-appropriate equipment and exercises that challenge each golfer, yet gives them the chance to experience immediate success. Your young athletes will putt, run, catch, pitch, chip, drive, throw and jump their way to a new level of playing golf. This camp will expose your child to the game in a fun and inspiring atmosphere. Equipment and snacks are provided, however, feel free to bring your own clubs. Please have your athlete wear athletic clothing and comfortable shoes. Register today by visiting or calling the proshop at 509-923-2359, calling Parker at 509-470-0621 or emailing Parker at pbarth@pga.com and remember, spots are limited!